Tracing back to innumerable years, textiles have played a very important part in the Andean society, due to the intense amount of manual labor it took to produce each one of the pieces. The process was so extensive that it was estimated to take an amount of 7 kilometers (7,655 yards approximately) worth of different colored threads to complete one tunic. Because of this, in its time, one article of clothing could have been worth more than it’s equivalent in gold and silver, as each type of clothing was also an indication of social status to which a person belonged to. 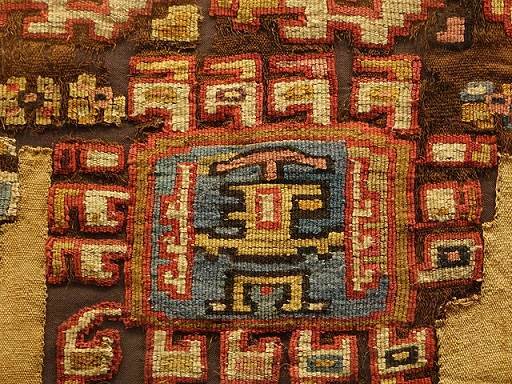 It’s for this reason, that in the Incan Empire the best form of tribute- the most prized – was to be presented with a textile article. There also exist, a type of sacred tunic which were especially made for important people, figures of the society, which had passed away. These individuals would be buried in their special tunics so that they’d be dressed in finery once they reached the Other World. This custom was practiced in the Paracas culture, whose settlers participated in this ritual for the dead. Due to the climate in these coastal desert areas, many of the mummified bodies have managed to stay preserved over time, in near to perfect condition. With the preserved mummies, the tunics and mantles they were buried with have also kept their attributes, so that now we have several examples of these wonderful pieces, without having lost any of their color and texture. The Pre-Incan man of Peru was astute and had a well developed sense in the areas of intellect and technology, which allowed him to create sophisticated tools for the time- but with an incredible simplicity- that were then used to make these types of textiles. One piece of art could incorporate a number of techniques, created by innovative use of the available resources of the time. The themes that occur most frequently in the tapestries found with the Paracas funeral bundles, revealed that the figures woven into the mantles were more symbols than real representations of reality. The artist would would put painstaking effort to portray things in a spiritual or intellectual way, whereby a depiction of a bird was the symbol for royalty and the anthropomorphic drawings represented the union between man and nature. These ancient woven textiles are surprisingly complex in their designs. Each depiction is singly unique and is never duplicated in any other area within the piece. The artist will create small variations of the form and color in each one of the images in the tapestry, which gives it a impressive visual richness when looking at the amount of fine detail in each of these. From afar it may look like the tapestries have a geometric form to them, but once you take a closer look, you realize that the images have a fluid movement about them, full of curving lines and with certainty one can say that this technique definitely takes a considerable amount of time to produce. The tradition of the Peruvian textile industry came about around 1400BC and was perfected throughout the periods of time when the Huari and Paracas cultures were in existence and extending until reaching the colonial period, where the Peruvian techniques began to fuse with the European way of threading and where the concepts also became a bit more abstract. In the weavings of the Peruvian colonial period, you can note the huge influence that the Huari culture had in the process, by noticing the finishing of the pieces which tended to be very complex. The woven pieces that seem minimalist in style, can be attributed to the Incan Empire, which around the 18th century (1700’s) formed a fusion of style with that of the European, and thereby switching between a linear form to a rounded or circular form.